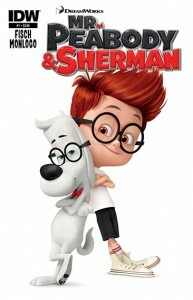 Before the release of Dreamworks Animation’s Mr. Peabody & Sherman movie (which we’ve mentioned recently), IDW is getting in the act by giving us the tie-in Mr. Peabody & Sherman full-color comic book mini-series. The first issue of four with hit comic book stores and the ‘net later this month. The series follows the adventures of the world’s smartest dog and his adopted human son, exploring history on the maiden voyage of Peabody’s marvelous WABAC machine. The comic series is written by Sholly Fisch (who seems to be getting around!) and illustrated by Jorge Monlongo. Previews has an interview with Sholly as well.